Lena, another protagonist I actually quite like, is a seventeen year old who follows the rules and does as the government expect. She's looking forward to going through with the procedure that will 'cure' her, like her other family members have been. The world in which Lauren Oliver has created is one that has came up with the perfect solution to end war, heartache & depression. They simply eradicate the emotion of love. Lena, with not much time left before she turns eighteen and will go through with the procedure, meets a boy, Alex. From this point on, Lena's world is turned upside-down & she is taken on a voyage of self-discovery. Not only was I completely emerged in Lena's personal story. I was gripped by the action that was happening around her. People living in a big-brother type of society in which nobody dared to step out of line. The consequences were frightening & some scenes in the book were saddening. I think this was one of the first books to make me form a lump in my throat. I don't cry easily, especially with literature. But one scene in this dystopian novel got me right in the tear-ducts! I loved everything. The action, the romance, the heartache. It was written in such a beautiful way. Oliver is one of my favourite Authors because of her knack for writing. She creates such depth to all characters in her books. And with Delirium she did just as well. Sadly for me, I recently finished 'Matched' by Ally Condie, a book that is so similar to Delirium that a friend of mine I lent both books to swore I had given her the same book at first. 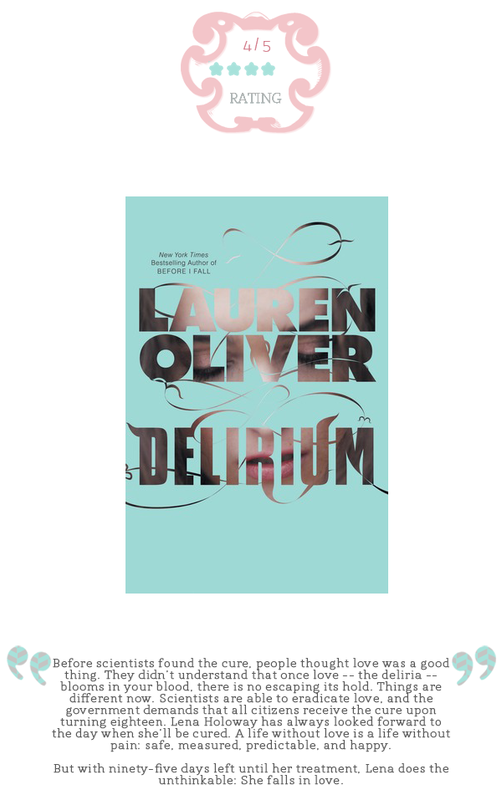 Matched however knocked Delirium out of the water and so it is because of that reason why I can't give this book a full 5 stars. This is definitely one to add to your wish lists. If you have yet to have a taste of Dystopian fiction, let this be your first. Awesome review! Glad you liked the book. I just recently got Delirium in the mail, and have yet to read it but am so excited to! I love a good dystopian, and if Matched is even better, I'll have to pick that one up too! Your blog is one of the cutest/best designed blogs I've seen out there! So pretty!